The Voidwhich Saga is a series of novellas about Mars Xi, a woman raised from childhood to be a weapon of the state. Imbued with incredible power which even her captors didn’t fully understand, she is now free. MEPHISTO, the ones who created her, have taken a friend hostage. And Mars will stop at no lengths to get him back. If you want to see what with thought of Killing Gravity, the first book in the series, you can find it here. The second book in this series differs greatly in tone from the first. This contrast is made all the more stark when reading these books back to back. 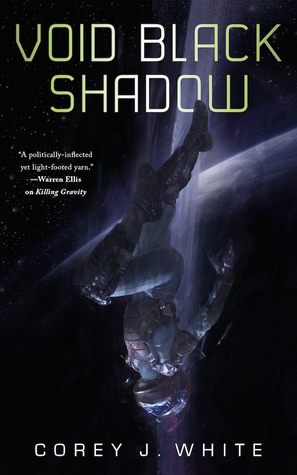 Void Black Shadow tackles the horrors mentioned but unseen in Killing Gravity and brings them to the forefront of the narrative. The feeling of pure adventure and the wholesale destruction Mars wreaks with little recompense in book one are gone. Instead, Mars must confront her actions since escaping MEPHISTO including the literal of thousands she’s slaughtered while trying to evade recapture. The majority of this novella takes place within a prison made for only the most egregious criminals. It is dark in a way the first book was not. Mars might murder her enemies in the way most heroes in large action/adventure science fiction movies and TV shows do, but she does not partake in the sort of torture and cruelty her enemies specialize in, and that is something we see firsthand here. While I was unsure how I felt about this shift in tone and pacing at first, it is definitely to the story’s benefit. Mars is a main character whose plans do not always turn out the way she foresaw. The line between self-preservation while on the run from objectively evil individuals/government states and committing similar atrocities is one that is blurred, but one Mars must confront. I greatly respect the book for taking the time to delve into this so well. What I expected was another fun romp through space with a main character slowly healing from a lifetime of hurt tracking down her old enemies and exacting revenge with a few bumps in the road. This? This was not what I expected, and it was wonderful because of that. If you don’t like darker stories that include things like torture, this might not be for you. Nothing in here was particularly bloody or gory – no more than the first book at any rate. But the darkness, the psychological torture, and the palpable sense of fear in sections might not be something for every reader, so do be warned if you think this might not be for you. I do wish we saw just a little more of some of the other side characters. Yet, because of the book’s first person narrative, that was largely impossible. Hopefully we will get more story with Squid and Pale in the next novella. Speaking of the next novella in the Voidwitch Saga, I am absolutely going to be reading it. I cannot wait to know how this wraps up. There are a number of subplots that haven’t been wrapped up yet, but are edging closer to a conclusion, and while I want to say that I feel like I knew where the story is going those same ideas proved to be totally wrong in relation to this book. In all, I would definitely recommend reading Void Black Shadow by Corey J. White and the Voidwitch Saga overall.